1 Voltage between + and - may be up to 26V, input current is 17mA. Open inputs will be read as a logic zero. 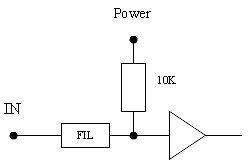 When the input voltage rises above the trigger level, the input will deliver a logic one. The mvBlueFOX is an USB device! Do not connect both USB ports at the same time. Differentiation between 'R' and 'U' version is obsolete. New mvBlueFOX versions have both connectors (circular connector and standard USB). The pin assignment corresponds to the description of 'R' version. 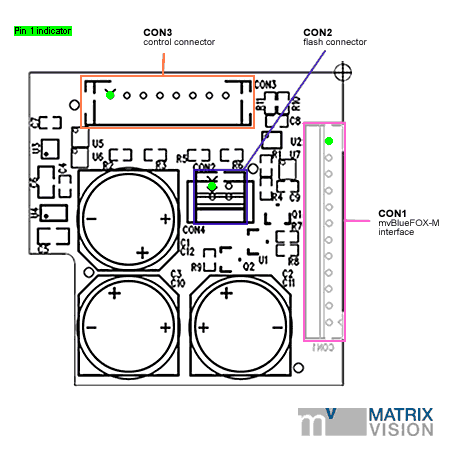 While mvBlueFOX is connected and powered via standard USB, it is possible to connect additional power via circular connector (only power; the data lines must be disconnected!). 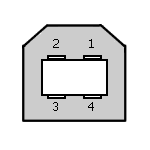 Only in this case, the power switch will change the power supply, if the current entry via standard USB is equal to or under the power supply of "circular connector". The mvBlueFOX-M has a serial I²C bus EEPROM with 64 KBit of which 512 Bytes can be used to store custom arbitrary data. Do not connect Dig I/O signals to the FPGA pins until the mvBlueFOX-M has been started and configured. Otherwise, you will risk damaging the mvBlueFOX-M hardware! The Dig I/O are connected directly via a resistor to the FPGA pins and therefore they are not protected. 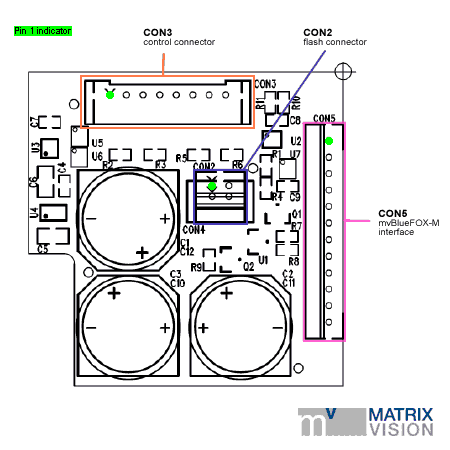 For this reason, an application has to provide a protection circuit to the digital I/O of mvBlueFOX-M. 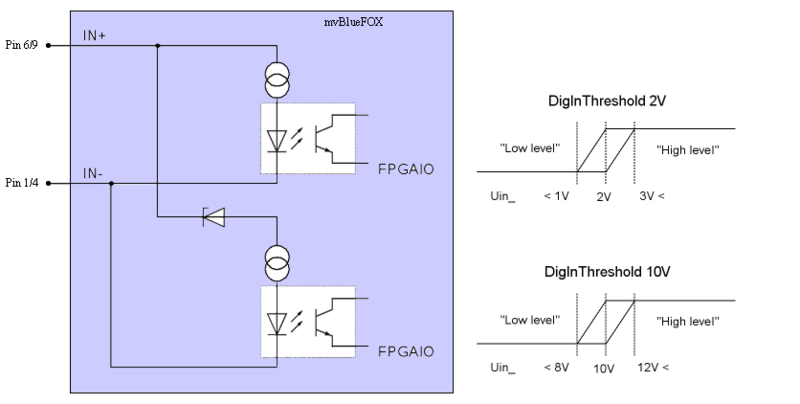 The Dig I/O characteristics of the mvBlueFOX-M are not compatible to the Dig I/O of the mvBlueFOX standard version. Model 1 can be connected to mvBlueFOX-M with a cable via CON5. Model 2 can be mounted on the mvBlueFOX-M via CON1 directly. 2 Attention: No over-current protection! The mvBlueFOX-MLC has a serial I²C bus EEPROM with 16 KByte of which 8 KByte are reserved for the firmware and 8 KByte can be used to store custom arbitrary data. 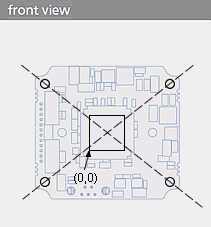 The sensor's optical midpoint is in the center of the board (Figure 21: intersection point of the holes diagonals). The (0,0) coordinate of the sensor is located at the one bottom left corner of the sensor (please notice that Mini-B USB connector is located at the bottom at the back). Using a lens, the (0,0) coordinate will be mirrored and will be shown at the top left corner of the screen as usual! If you have the mvBlueFOX-MLC variant which uses the standard Mini-B USB connector, pin 2 and 3 (USB_DATA+ / USB_DATA-) of the header won't be connected! 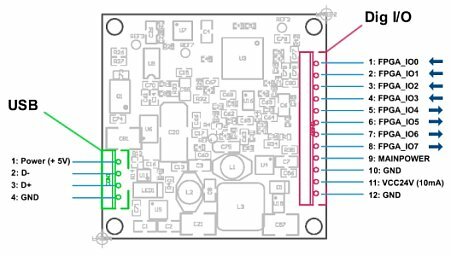 I2C bus uses 3.3 Volts. 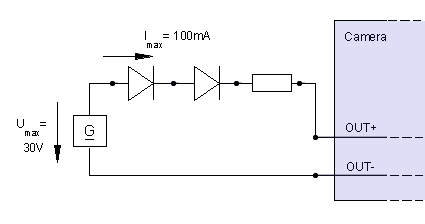 Signals have a 2kOhm pull-up resistor. 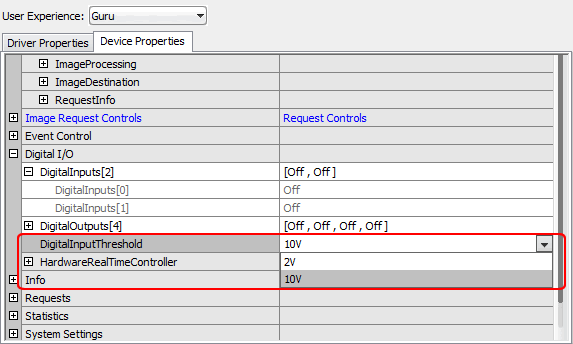 Access to the I2C bus from an application is possible for mvBlueFOX-MLC devices using an mvBlueFOX driver with version 1.12.44 or newer. If the digital input is not connected, the state of the input will be "1" (as you can see in wxPropView). The inputs can be connected directly to +3.3 V and 5 V systems. 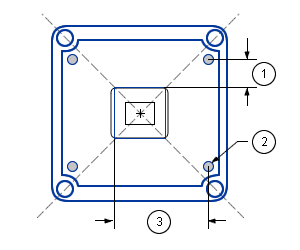 If a higher voltage is used, an external resistor must be placed in series (Figure 25). The mvBlueFOX-IGC has a serial I²C bus EEPROM with 16 KByte of which 8 KByte are reserved for the firmware and 8 KByte can be used to store custom arbitrary data. 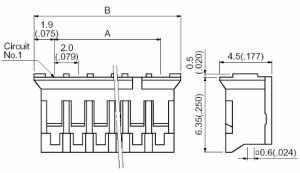 Please have a look at the mvBlueFOX-MLC digital I/O characteristics (opto-isolated model) of the 12-pin Wire-to-Board Header (USB / Dig I/O). 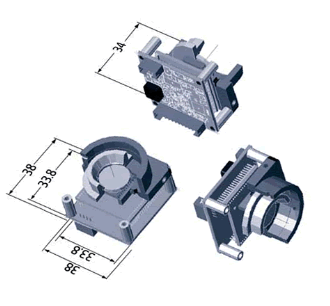 Tolerance of mounting holes of the printed circuit board in relation to the edge of the lens holder housing is not specified but produced according to general tolerance DIN ISO 2768 T1 fine. 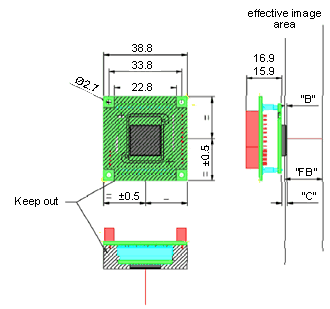 Tolerance of mounting holes on the printed circuit board because of the excess of the holes ± 0.1 mm (Figure 32; 2). 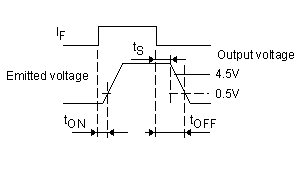 Tolerance between conductive pattern and mounting holes on the printed circuit board. 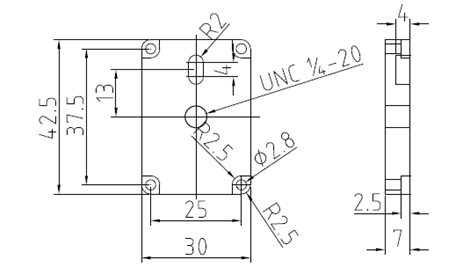 Further specific tolerances of other models on request. There are also tolerances in lens which could lead to optical offsets.